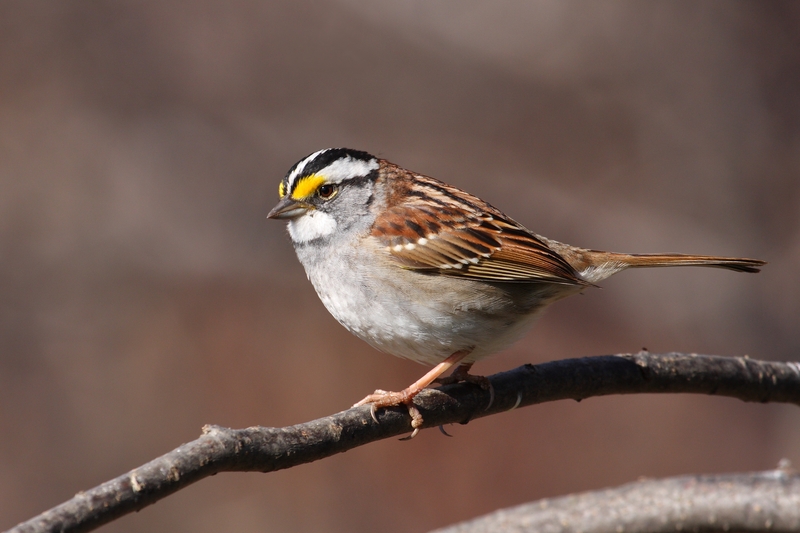 As we transition from winter to spring, one bird that may be spotted on its migration back north to cooler climes is the White-throated Sparrow, a winter resident of the Asheville area and our March 2016 selection in our 12 Months of Birding at the Inn blog series. An occasional visitor to the ground below the bird feeders at the Inn on Mill Creek in February and March, the White-throated Sparrow is pretty easy to spot. And it’s easy to see where the White-throated Sparrow gets its name, with its bold white throat contrasted against a grayish brown body. It also has a striking black and white striped head, with a bright yellow patch between its eye and bill. We’re guessing that “black-and-white-striped headed sparrow with bright yellow patch on its face” was a bit long for a moniker. So White-throated Sparrow it is. The primary places to see White-throated Sparrows around the Inn on Mill Creek are in the various rhododendron, forsythia, burning bush, and other shrubs along the driveway, near the bird feeders and along the edge of the apple orchard. They are also frequently spotted at different locales around Asheville and Black Mountain, including Biltmore Estate, Lake Tomahawk Park and Warren Wilson College. Generally by April, they’ve headed out on their way to Canada and the far northern parts of the U.S.
Hi Patricia, thanks for sharing! As the weather turns here, we’re keeping an eye out in our rhododendron…they really seem to love it.